It’s not often that a play opens on the same day that one of its characters is canonized. But that’s exactly what happened on April 27 when The Last Confession opened in which the late Pope John Paul II is a character. It is safe to surmise that the majority of people who go to see The Last Confession are not attending because it is the North American premiere of a play by Roger Crane. Instead, it is likely that the sole draw for the play is that its central character is played by David Suchet, an actor known around the world as the television incarnation of Agatha Christie’s Belgian detective Hercule Poirot. Crane’s play about the unusually short reign of Pope John Paul I (August 26-September 28, 1978) is no great work but it is an ideal vehicle for Suchet to reveal his enormous range as an actor. Even if you have no interest in Vatican politics, Crane’s play is intelligent enough and Jonathan Church’s direction is so slick that they make going to see David Suchet on stage a rewarding experience. The Last Confession is the first play by American lawyer-turned-playwright Roger Crane. After a decade of rejections because of its subject matter, the Chichester Festival in England gave the play its world premiere in 2007 with David Suchet in the lead. It transferred to London’s West End for a successful run. The run in Toronto is the first stop in a world tour that will take the play to Los Angeles and various cities in Australia. The play is not the advertised whodunnit or thriller but rather an examination of the paradox of political struggles within the Vatican. The irony that Crane finds so fascinating is that men who are gathered together to do God’s work are no different in how they form factions or fight or welcome change than people in any secular institution. Those in the Vatican, however, have the unusual excuse that God’s will may be directing their egocentric plans. mentions that the Church was involved in are also real. Like any historical dramatist Crane has filled in with supposition those aspects of the story that are not, or never will be, known. Another reason is that the play requires a cast of 20, something only a theatre festival is willing to take on. The frame for the action is the last confession of Cardinal Giovanni Benelli (David Suchet), Archbishop of Florence from 1977-1982, who was Substitute of the Vatican Secretariat of State known for his authoritarianism. He is dying and tells his story to a mysterious priest who arrives as his confessor (Philip Craig). His has also written out his confession and hopes the priest will publish it after his death. The substance of his confession is that he “killed” Pope John Paul I. After the initial shock, it becomes clear fairly rapidly that Benelli could only have “killed” John Paul unintentionally and through very indirect means. As Crane shows Benelli was considered a leading contender to be pope after the deaths of both Pope Paul VI and Pope John Paul I. What is known is that Benelli supported Albino Luciani (Richard O’Callaghan) at the conclave after Paul VI’s death. Luciani is a humble man with liberal ideas, who eventually was chosen as the first Pope John Paul because of Benelli’s machinations to help him to win. By supporting Luciani, Benelli has the advantage of having someone else do the work of reforming the Vatican without having to do so himself. One aspect of Benelli’s confession is his cowardice in forcing a kindly man to deal with the jackals who wielded power in the Roman Curia, or administrative body of the Holy See. John Paul’s goal is to implement the reforms of the Second Vatican Council that his predecessor, Paul VI (Donald Douglas), was unable to do. Reactionaries in the Curia – like Cardinal Villot (Nigel Bennett), Cardinal Felici (John O’May) and Cardinal Baggio (Kevin Coulson) – attempted to insure that John Paul could take no action. When the Pope tried to publish his liberal views on birth control and artificial insemination, they altered them to reflect their conservative views. John Paul also tried to rid the Vatican of scandals such as the use of its bank, overseen by Bishop Marcinkus (Stuart Milligan) of Chicago, for money-laundering and the disappearance of $1.3 billion in loans. On the day before he was found dead, John Paul had told the obstructionists Villot, Baggio and Marcinkus that he planned to move them out of the Vatican. The fact that John Paul has been in good health, and that the Vatican never conducted an inquiry nor an autopsy led to the rumours Crane exploits that John Paul was murdered. crisis Benelli faces as he pursues his inquiry is posed by Cardinal Ottaviani (Bernard Lloyd). Does Benelli want to pursue the case to its conclusion and bring disgrace on the Vatican or does he wish to be the next pope? Benelli is obviously such a juicy role it is no wonder Suchet would wish to use it to showcase his talents and at least provide a more complete view of him as an actor than the Hercule Poirot everyone knows. What Suchet provides is really a masterclass in acting that anyone who loves the theatre should experience. The role allows him the widest range from outburst of pride to remorse and contrition, from icy calculation to fervent emotion. Suchet interprets his role with precision and control and does so as much with his voice as with facial expressions or gestures, an art no Canadian actors seem to have mastered since the death of its last great Canadian practitioner, William Hutt (1920-2007). Suchet uses pauses and changes of pitch, volume and intonation as tools to layer his lines with as much meaning as possible. He can often speak words but convey an opposite sentiment at the same time. Some actors can attract attention only through loudness. Suchet can do so with a whisper. Suchet, however, is not the only actor you will love to watch. Richard O’Callaghan makes Cardinal Luciani, later Pope John Paul I, a wonderfully vivid figure. The humility that is his main characteristic at first makes us wonder how such a man could ever wield power. Yet, once Luciani takes on the role of Pope, an office he never aspired to, O’Callaghan demonstrates the unbending strength of virtue that inspires an unassuming man to confront those who flaunt their power before him. O’Callaghan makes us understand how John Paul would wish to demystify his office, regarding himself merely as a parish priest whose parish just happens to be the world. Kindly, humorous and unpretentious, his John Paul contrasts completely with the unfriendly, self-righteous and vain men around him. The producers have surrounded Suchet with an exceptionally fine cast from Canada, the US, Australia and the UK. It was heartening so see such Canadians as Nigel Bennett, Philip Craig, David Ferry, Marvin Ishmael and Roy Lewis holding their own in this international team. Bennett, who has the largest role of these, is the embodiment of the old guard, so sure of their rightness yet so threatened by loss of power, that their egotism pushes them to insolence even in front of the Pope who is their superior. Crane’s play fortunately does not try to solve the mystery of John Paul I’s death, but uses it rather as a means for exposing how institutions even with a divine mission can fall prey to the goal of self-perpetuation without self-examination or self-reformation. Crane introduces so many characters so quickly that it is difficult to remember who is who right up to the end. He overuses copular sentences as to create pseudo-profundities, such as “He is just a man, but he is also the Vicar of Christ”, etc. And Crane’s ending is unnecessarily melodramatic. Nevertheless, The Last Confession is worth seeing not just for the splendid performance of David Suchet, but for the top-notch performances of the entire cast. 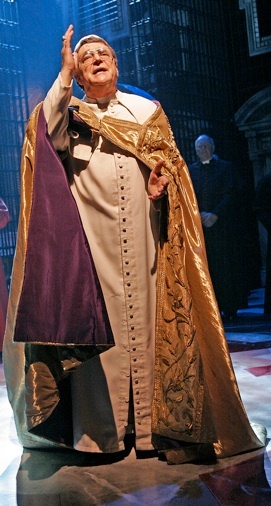 Photos: (from top) Peter Harding, Richard O’Callaghan as Pope John Paul I, David Suchet as Cardinal Benelli, Philip Craig and Nigel Bennett; Richard O’Callaghan as Pope John Paul I; David Suchet as Cardinal Benelli. ©2014 Cylla von Tiedemann.